Welcome to the JiaoLong Team's website! JiaoLong team focuses on the development of service robot and its correlative technology. 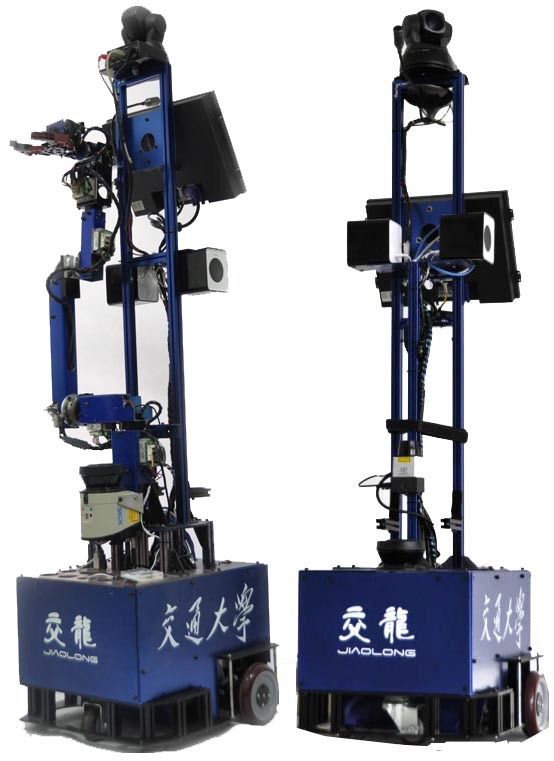 Frontier-I and Frontier-II robot are our products as autonomous mobile robot, so are the Omnicam06 of omni-vision system, the intelligent wheelchair and the safe manipulator as service robot . We have been putting efforts in applying a number of Image Processing, Navigation, Localization, and Mapping Methods, which results in the continuous enhancement of our robots. The Frontier-I robot had participated in the RoboCup for MSL league in year 2003 ( Padua Italy ) for the first time, as JiaoLong Team on behalf of Shanghai JiaoTong University. So we did for RoboCup 2004 (Lisbon) and 2005 (Osaka). Then, in 2006 Nubot associated with us to make a mixed team for RoboCup 2006 MSL league (Bremen). Now Frontier-II robot has prepared for the @home league in RoboCup 2010. It is an update version from Frontier-I. We won the championship of the @home League in China Open 2007 ( Jinan ), China Open 2008 (Zhongshan), China Open 2009 (Hefei) and China Open 2010 (Ordos). Especially in @home League of China Open 2008 and China Open 2009, we won championships both in General Application and Open Challenge. Although JiaoLong only got the 8 th position in RobotCup 2008 ( Suzhou ) and no participation in RoboCup2009.